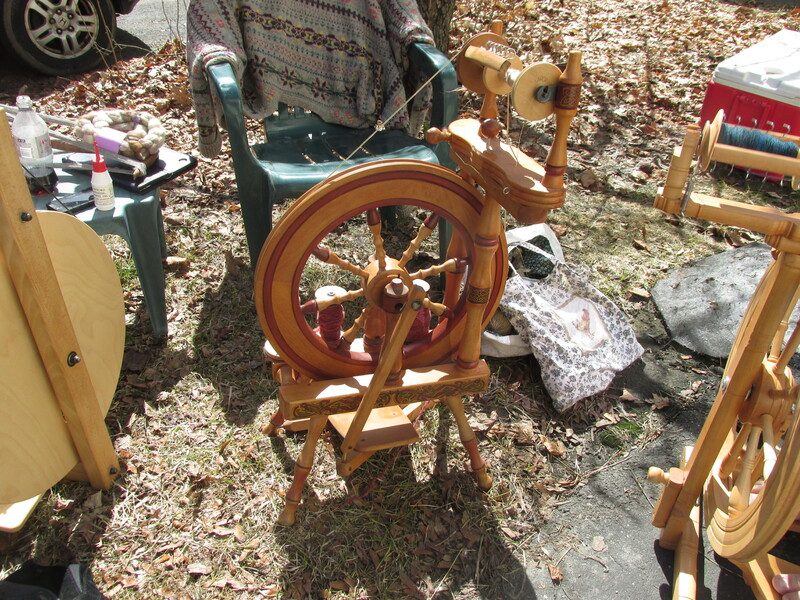 Yesterday was spinning day at Jane’s. 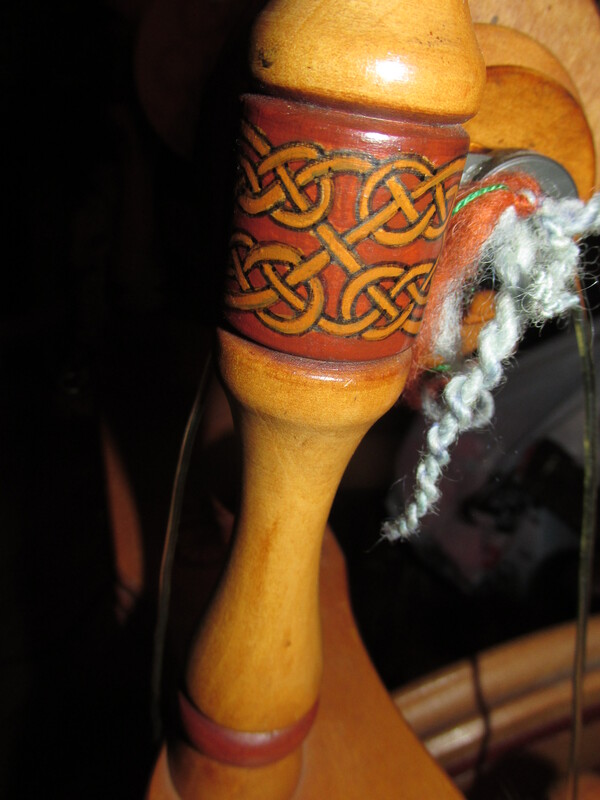 I packed up my knitting, my beautiful Irish Wheel doesn’t like to go anywhere . 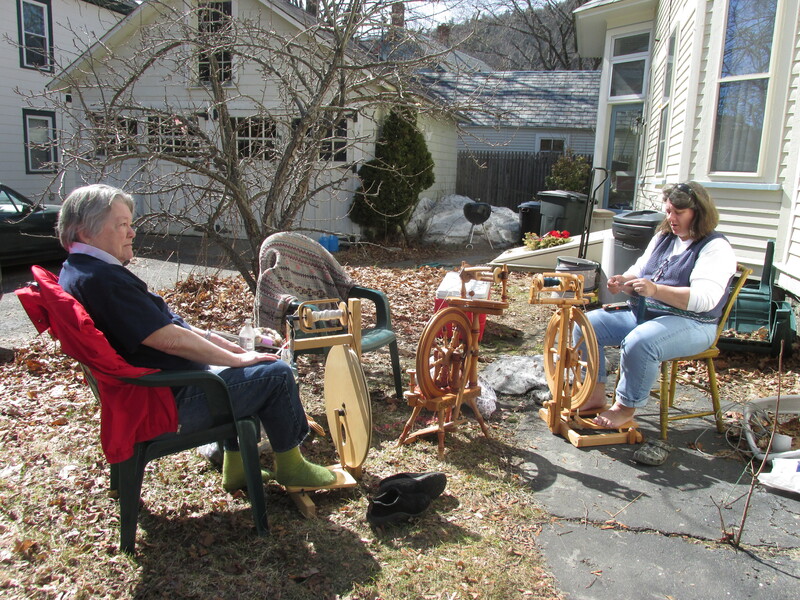 It was a beautiful day and we spun outside. It was delightful to feel the sun. We were talking about wheels and Jan asked me what kind of wheel would I get and I answered an Ashford Traveler. I have had one for years and wore it out. Its easy and lightweight , great for taking places. Jane went inside and came out with the wheel pictured below. She said I have too many wheels and you can pay me when you do a show. I was speechless. 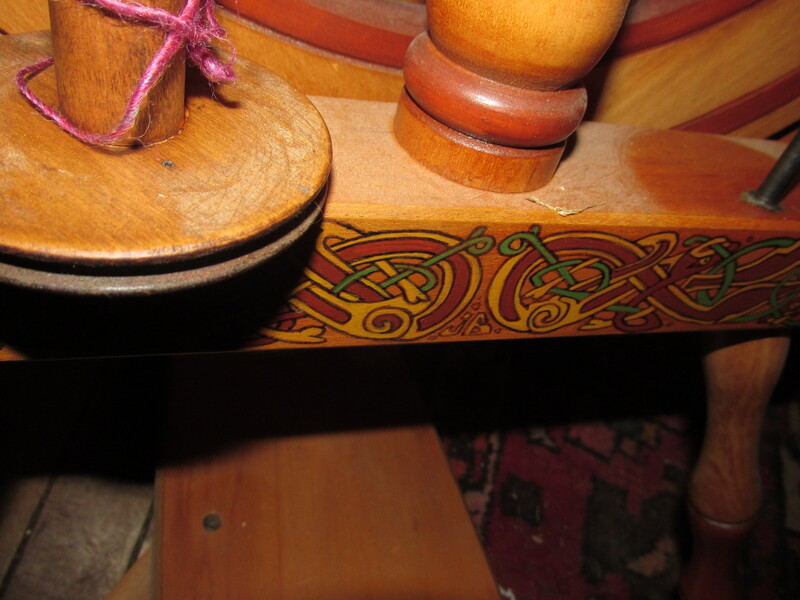 It is a beauty with Celtic designs painted on it by an artist. We all agreed it fits me. I never expect to be bringing home a new wheel. Thank you Jane. 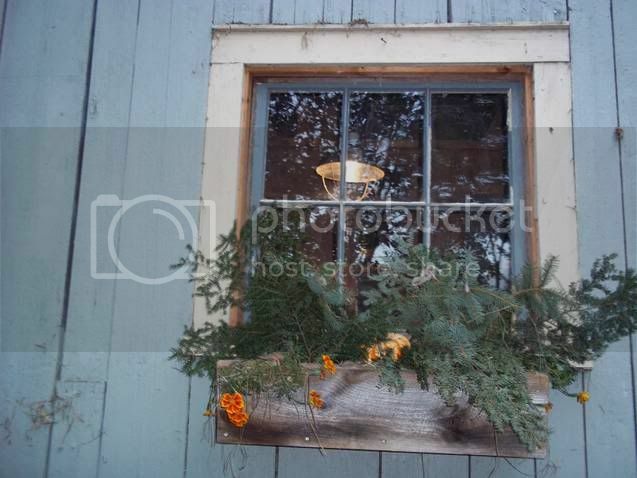 Pictures of the beautiful art work. The nest is cozy and every day I am taking out the extra egg. She will be a wonderful Mom . I am now looking for a used 100 gallon galvanized waterer to put Morticia and the chicks. That’s what they use at tractor supply and it works well. I don’t want them outside till they are 2 months old or more and after having some chicks killed it would be better to have them in the house.. Less chance in something happening to them. I am still at it and should be done the beginning of the week. I have to call my shearer and get him lined up to come after Easter. Tomorrow I am going to a friends who recently moved to town to watch her shearing day. Minnie and her basket, she has had it since she came here and it has a woolen blanket inside to keep her warm on cold nights. I have made an appointment with the vet for Minnie on Thursday. She needs a check up and is really not taking care of her coat. I am trimming mats all the time and combing and brushing her. 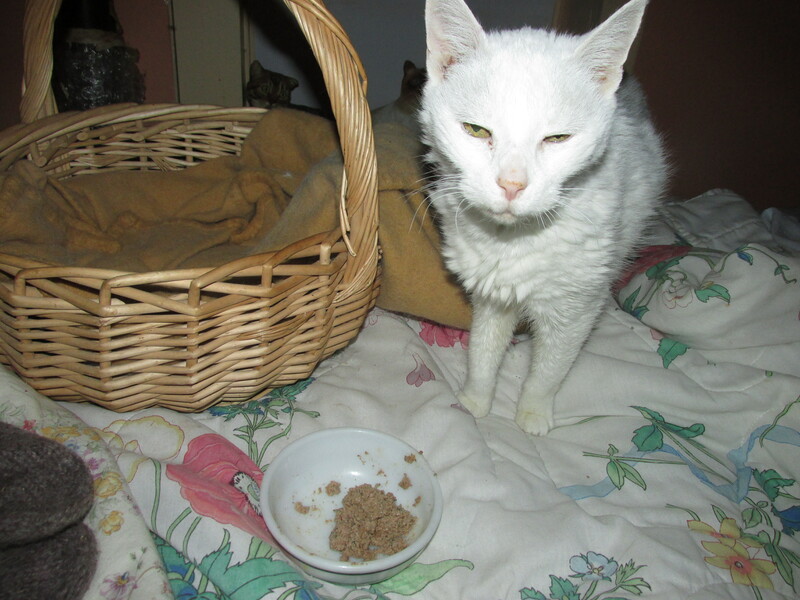 I am trying some different food as fancy feast is not really good for a cat with kidney disease. But she needs to eat and cats that have kidney problems tend not to want to eat. So far so good. My friend Deb said to make her some chicken and rice so I have that going in the crock pot. She likes people food much more than cat food. I suppose that was all she ate when she lived in the streets of Puerto Rico. I wonder what her life was like. She is terrified of a soda can opening. Thank you for reading my blog today and I hope you enjoyed your day. What a generous friend – such a lovely treasure! Can’t wait to see pics of the chicks! Hugs to Minnie. Yes I am lucky to have such great friends. Minnie is a treasure. I am sure she has seen many things in her life but she is now safe here and living a good life. I do hope I can find a large space to put them in but if worse comes to worse I think I have a playpin in the attic and can put chicken wire around it and that will do. Many thanks for your kind comments Eliza. Will you attend the Mass SHeep and Wool Fest? Perhaps… I’ll be sure to introduce myself if I do.